Homemade BBQ Sauce. Readers have been asking for a DIY BBQ sauce for some time now. Thanks to my husband, we now have a homemade BBQ sauce that is completely delicious. This healthy and vegan BBQ sauce recipe is all his. If you like homemade salad dressing recipes, then you might also like this post. Most store bought versions of BBQ sauce contain high fructose corn syrup or some other form of processed sugar. 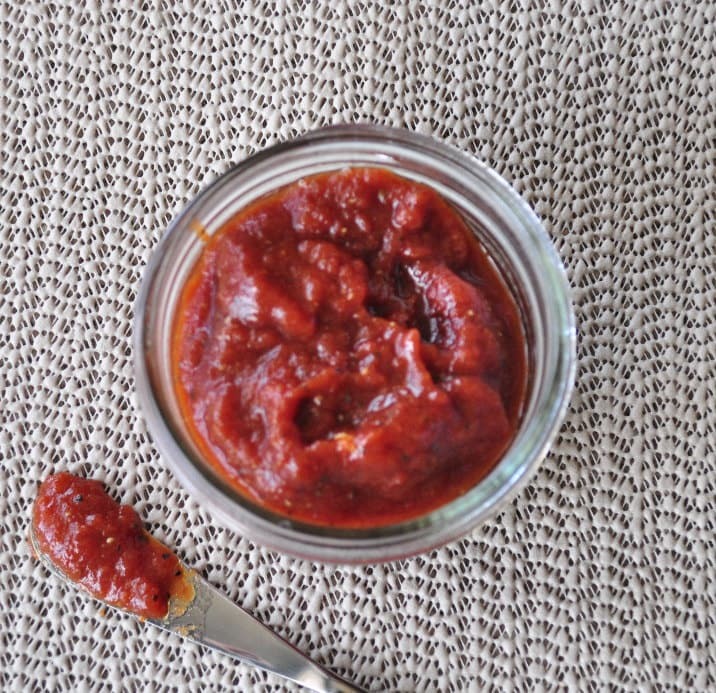 This BBQ sauce recipe contains no processed sugar and I promise you it’s delicious! This recipe makes a good sized amount and I imagine it would stay good in the fridge for a couple of weeks. We will be using this spread in some upcoming recipes. This BBQ sauce recipe is vegetarian and can easily be made vegan if you use maple syrup instead of honey. Mix all the ingredients together in a bowl. That’s it. Use immediately or store in the fridge in an airtight container. I save glass jars just for the purpose of storing things like this. Do you have a suggestion for a soy free worcestershire sauce replaement? I'm not sure. :( I use Annie's because it's vegan. I am just loving all your recipes. We have just recently begun making healthier food choices and your recipies are so helpful. I was feeling bit overwhelmed with figuring everything out, but your blog has been a life saver!! On this recipe, I was wondering if regular honey can be substituted equally for the raw honey. Thanks so much!!!!! You are so welcome Cindy! Glad you are enjoying them! This was a good basic recipe, but I found it lacking in spice. Where's the cayenne and/or chili powder? I added both plus a little cinnamon and allspice. I cut back on the vinegar and added the juice from a honey tangerine plus some prepared stoneground mustard. It came out really great. Add a little of each spice at a time until it is to your liking. I used brown sugar and honey to sweeten lightly. I prefer spicey with a little sweet. I didn't measure anything except the six ounce can of tomato paste which was of course already measured. Even the water I added till it was just right, after the tangerine juice of course I also heated it up in a small soup pan, just so the flavors would blend quickly. Next time I think I'll add some microplaned jalapeno and onion for a little extra flavor. Get creative people. Can I use ketchup or tomatoe sauce instead of paste. (It's soooo cold today and I don't want to go out but I want to make this! Very very good and so easy. I did adjusted it a bit to suit me but the idea came from you. Thank you. Do you think canning this with hot water bath method would allow a longer storing time? Made this yesterday and it is now officially my favorite bbq sauce AND salad dressing. I love bbq sauce in my salad :P. I didn't have tomato paste on hand, but had tomato sauce. So used 1 cup of that and omitted the water. I used 2 tbs of my homemade Worcestershire and 1/2 tsp of liquid smoke I cooked it on the stove for about 10 minutes to slightly thicken it up. I drizzled it on my salad last night (romaine, spring salad mix, du puy lentil, bosc pear, purple onion and kohlrabi). It was delicious beyond words! I shall continue making this. Thank you Melissa! You are so welcome Chen! So glad you liked it!